Manicure is a good treatment for hands. It makes them smooth, neat and beautiful. The hands and nails are given detailed attention and care. Warm water, emery board, scrub, orangewood sticks, towels, nail clippers, cuticle clippers, cotton, cuticle cream, cuticle softener, hand lotion, nail polish remover, nail brush. All instruments should be placed on a pad soaked indisinfectant (Detol) in the tray or drawer of the table. Seat the client comfortably, and place a towel on the lap. Remove old nail polish carefully. Wash the hands with warm, soapy water, and clean nails gently using a soft brush. Trim and shape nails as per clients requirements. Place the patron's left hand in a bowl of warm, soapy water. File the nails on the patron's right hand. Remove the left hand from the water. Carefully dry the fingertips and gently push the cuticle back with towel. With a cuticle cutter or cotton-tipped orangewood stick, gently push back the cuticle with a lifting, circular motion from the corner to the centre of the nail. Immerse the right hand in the warm soapy water. Apply cuticle cream or oil to the left hand. Using a cotton-tipped orangewood stick, apply the oil or cream around the base and sides of the nail. Massage into the fingertips with your thumb. These products soften and lubricate the cuticle and are recommended as an overnight treatment for nails that are dry and brittle. Apply nailwhitener under the free edge ifneeded for a whitening effect. Apply the product carefully with an orange wood stick. Avoid using an excess amount to prevent it from smearing he fingers. Apply hand cream and gently spread it over the entire hand. Rotate the top of hand, palm, and wrist, then slide out to the fingertips and rotate. Remove the patron's right hand from the water. Brush the nails. Place the fingers of the left hand in the finger bowl. Remove the cuticle cream or oil and nail white from the nails by brushing with a downward motion from the base to the fingertips. Thoroughly dry the nails and re-examine them. Apply base coat, starting with the thumb, then the little finger, then the ring, middle, and indexfingers.This will allow each finger to moveout of the way for the next one and will prevent smearing the base coat. Brush and clean the nails of the right hand and apply base coat. Apply nail polish to left hand then to the right hand. Remove excess polish. Dip a cotton-tipped orangewood stick, in remover and carefully go around each cuticle. Apply top coat. For added protection, brush the top coat under the tips of the nails. For a smooth polish application, hold the brush with the thumb and index finger and steady your hand with your little finger. Apply the polish quickly with long, light, even strokes. Make sure there is enough , enamel on the brush so that it will flow freely from the base to the tip : of each nail, but'be careful not to overload the brush. First brush the centre of the nail from the base to!the tip. Stroke around the base of the nail, close to, but not touching, the skin, and down one side of the nail. Stroke down the other side of the nail. 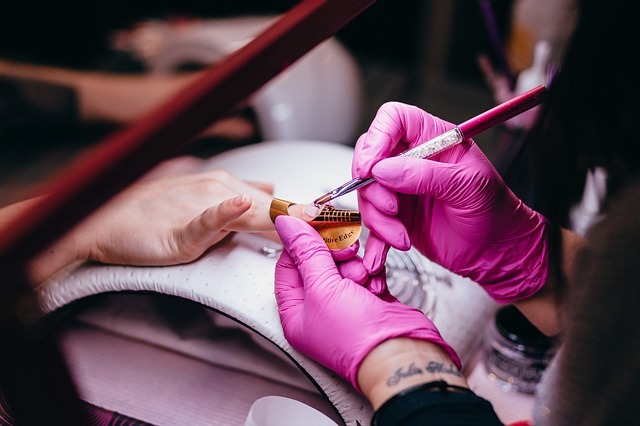 Wipe across the tip of the polished nail with your thumb or with a tissue wrapped around your index finger to create a hairline unpolished area. This helps to prevent chipping of the enamel. When the first coat of polish is dry to the touch, apply a second coat. Apply a top-coat sealer over the nail plate and under the tip ot the free edge. The top coat must be applied quickly and lightly because it dries rapidly. Be sure the consistency of the polish is thin enough to flow evenly and smoothly. If the polish is too thick, add 2 or 3 drops of polish solvent several hours before using it to ensure even thinning. Apply polish quickly in long even strokes for a smooth appllcation. Remove all traces of polish from the skin with a cotton-tipped orangewood stick dipped in polish remover rather than smoothening it with the finger or thumb. Be sure each coat of lacquer is dry to touch before-applying another coat. If polish is not 'completely dry, it will partially dissolve, leaving irregular bumpy areas. Dry the polish naturally. Heat causes bubbles to appear, and the polish will be uneven. Avoid thick applications of polish, because thick coats peel easily.